Contents: Pizza, rice crispy treat, fruit cup, chocolate milk, carrots, ranch, Fritos, celery with peanut butter and raisins (ants on a log), fruit roll up (? ), and a mystery item by the pizza. Notes: Man that is a lot of food and calories. 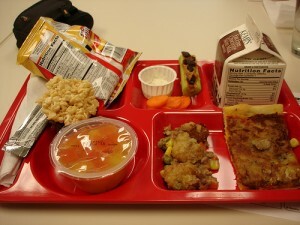 Why is this student eating so much food? The mystery item almost looks like some sort of breaded chicken, peas, and corn mix? That's a lot of food for a child's lunch!